Rice noodles often get forgotten in the back of our larder. Much better to use them up in a soup or laksa like this one which is substantial enough for a main course. This recipe is gluten-free – the only reason we’re telling you that is because from now on we are going to add a gluten-free tag to any recipes that are gluten-free. So very soon you will be able to search JonoandJules for gluten-free recipes. Wine Suggestion: We quite often plump for a Riesling when eating aromatic Thai dishes but have found another gem that works superbly for this hot, spicy, creamy, coconut dish: Alsace Pinot Gris. Often overlooked the richer styles favoured in Alsace provide a counterpoint to the heat and bring spices and texture of its own to the mix. For this dish we had a Bott-Geyl Points Cardinale, which is a Pinot d’Alsace, that is a blend of Pinot Blanc, Pinot Gris, Pinot Auxerrois and Pinot Noir. We found it both elegant and rich with a fresh attractive fruit and a breadth of flavour to match the Laksa. We’re on the lookout for more Pinot Gris and dishes to try now after the success of this match. Make the paste by putting all the ingredients in the small bowl of a food processor or mini food processor and whizz until finely chopped (if you don’t have one of these you can grind them with a pestle and mortar). Spoon 2 tbsp of the paste into a bowl. Add the chicken strips, season well with salt and pepper and stir until evenly coated with the paste. 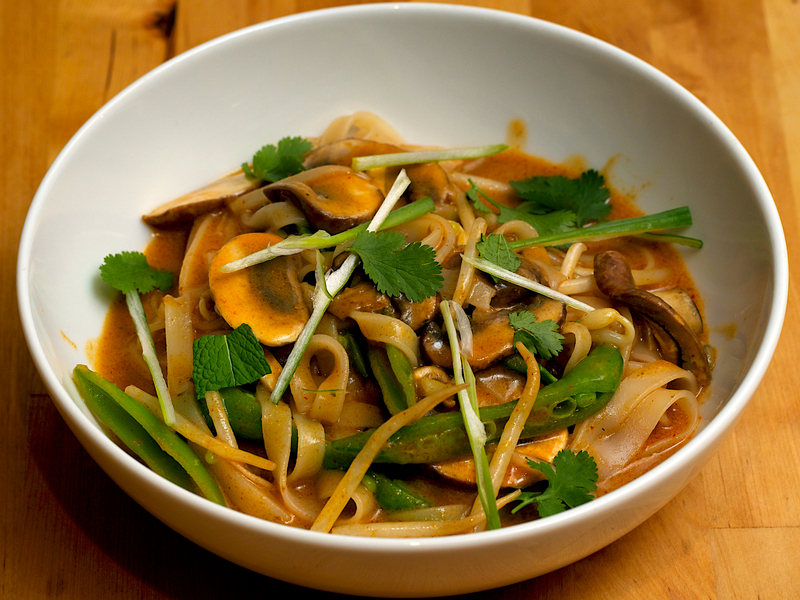 Put the rice noodles into a shallow dish and pour over boiling water from the kettle to cover. Leave for 10-15 minutes or until softened. Drain and refresh under cold running water, then snip into short lengths with kitchen scissors and set aside. Heat a large frying pan or wok over a high heat. Add 2 tbsp of sunflower oil and when hot, tip in the chicken and fry quickly for about 3 minutes or until nicely coloured and just cooked. Remove with a slotted spoon and set aside. Heat the rest of the oil in the same pan, then add the scallions and the remaining paste and fry for a minute. Add the coconut milk, fish sauce and lemon grass. Bring to the boil, then simmer for about 5 minutes. Add the chicken to the soup and simmer for another 3-4 minutes. Divide the noodles between 4 deep bowls. Remove the lemon grass stalk from the soup and add the lime juice. Ladle the soup over the noodles and sprinkle with coriander leaves to serve. 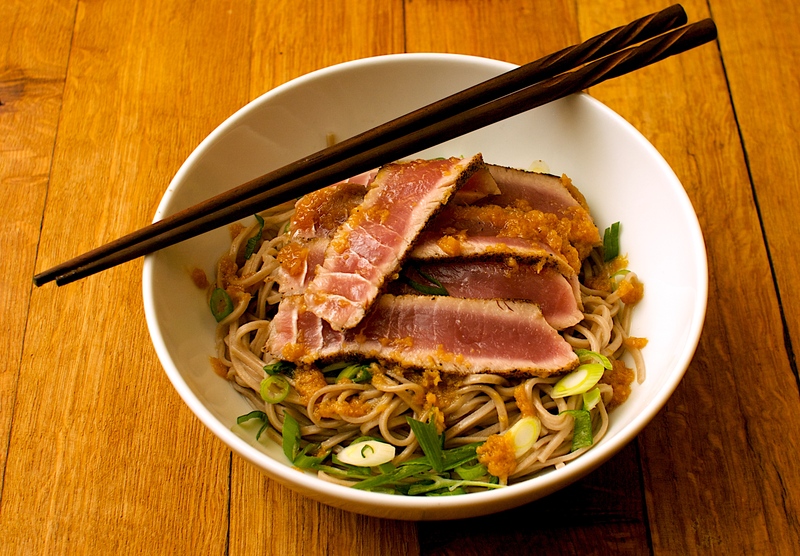 This is really quick and healthy, with nice fresh flavours. Pour boiling water over the noodles and leave to soak according to the pack instructions. Drain and cool under running water. Cook the lemon grass and shallots for a couple of minutes, then add the pork and cook until browned and cooked through. Stir in the sugar and stir to dissolve. 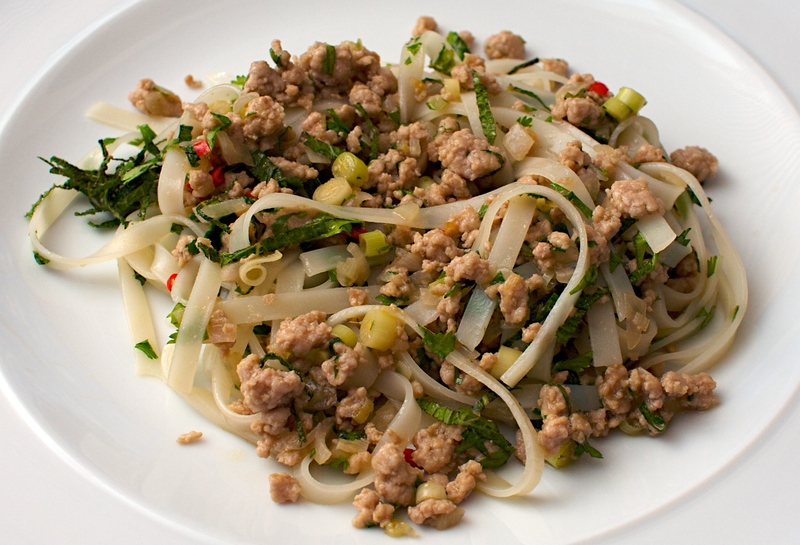 Mix the dressing ingredients together and toss with the noodles and pork, then add the coriander and mint and serve. Drink with: a glass of Riesling – try with one of the slightly off-dry New Zealand styles.